Continuing our tradition of supporting the competitive robotics community, we’ve created a dedicated portal for FTC teams! This portal includes a collection of our existing products. Everything is now available in one easy to find place. FTC's open robot rules allow for you to take your robot's customization to the next level, and we have everything from motors, to sensors and structural parts for your robot. Best of luck to all teams competing in Rover Ruckus! Build Blitz was a week-long event in which VEX engineers designed a robot to play Rover Ruckus. During this time, we strategically analyzed the new game, developed mechanisms designed to play it, and documented every step along the way. The idea of Build Blitz is not about developing the best FTC robot to play Rover Ruckus. Instead, we focused on medium-level and inexperienced teams wanting to raise their level of play for the 2018-19 season. We want to provide these teams with the groundwork they need to succeed, while also eliminating early-season frustrations. Similar to our last Build Blitz in 2015, we’ve rolled out a variety of educational materials, application examples, design guides, strategy analysis and prototyping videos. 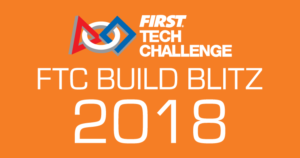 We were even sure to use some our newly released products, so that FTC teams can get a first-hand look at how they look in these new applications. For a full recap of Build Blitz, check out our blog!